While the debate around vouchers is loud and needed, we must not forget about the other bills that are making their way through the legislative process. Here are four bills that teachers need to know that will change how teacher effectiveness and preparation are measured. The proposed bills all look like they will pass and become law. Spread the word about these bills so teachers will have the most updated information. There is a consensus that we need to improve the preparation of future teachers. Teachers need the most updated information from faculty that still have connections to the classroom. Requires full-time educator preparation program faculty members, including academic deans, to have direct personal involvement in public schools or local education agencies (LEAs) annually. Requires faculty involvement to include professional learning targeted to pre-K through grade 12 teachers; learning focused on LEA specific initiatives; direct instruction to pre- K through grade 12 students; district-level partnership; or observation of pre-K through grade 12 teachers. The bill has passed the Senate and is waiting to be taken up in the House Finance committee this week. Right now, you are able to log on the Teacher Prep Report Card to find out information about how teacher preparation programs are doing in preparing teachers for the classroom. This bill will add teacher observation data into this mix. The bill requires the department of education to provide all state board of education approved teacher training programs access to annual evaluation data for teachers and principals graduating from the programs for a minimum of five years following the completion of the program. It’s not clear if the public will be able to see the evaluation data from the different preparation programs. Either way, I hope the programs will use the data to improve. The bill has passed the Senate and is waiting for the House to take it up this weeks. This bill deals with assessment data that are used in overall teacher evaluations. The bill makes permanent the flexibility to use the most recent year of TVAAS student growth, if it leads to a higher evaluation score for the teacher. I’ve heard that some superintendents like this bill because it could be used to reward a teacher for a large one year growth. The three year growth option will allow teacher flexibility to change schools, grade level, or move to support a higher need population. Requires the student growth portion of teacher evaluations to account for 10 percent of the overall evaluation criteria in FY16-17 and 20 percent in FY17-18 and each year thereafter. Requires that the most recent year’s student growth evaluation composite account for 35 percent of growth data in a teacher’s evaluation, if such use results in a higher evaluation score. Authorizes the use of educational progress and evaluation data for research purposes at postsecondary institutions. Requires Tennessee Comprehensive Assessment Program (TCAP) subject-area scores to make up the following percentages of elementary and middle school students’ final spring semester grades in grades 3-8: 10 percent in FY16-17; 15 percent in FY17-18; and 15 to 25 percent in FY18-19 and subsequent years. This bill has passed the House and is waiting to be passed in the Senate. Requires local education agencies (LEAs), by the 2018-2019 academic school year, to adopt at least one appropriate alternative growth model approved by the State Board of Education in order to provide individual growth scores to teachers in non- tested grades and subjects. Requires the Department of Education (DOE) to develop valid and reliable alternative student growth models for non-tested grades and subjects currently without such models. Teachers, what are thoughts on these four bills? Let us know in the comments. For more on education politics and policy in Tennessee, follow @TNEdReport. Just a group of moms and dads and teachers and administrators and engaged community members working together to make Tennessee schools great. Sounds nice, right? Tennesseans for Student Success is made up of moms and dads, teachers and parents, administrators and education leaders, and community and elected officials. If you are interested in joining our work, we have a place for you to be a part of this historic work. We hope you’ll join us in one of our Coalitions for Student Success. Our students are more prepared for their next steps than they have ever been before. Tennessee’s kids are now better prepared for life after school, but there is more work to be done. We need your help as we all work to spread the message of student success in counties and communities across the state. See, a perfectly positive group spreading the message of student success all across Tennessee. They sure don’t like that Gloria Johnson. You know, the former state rep. running for her old seat. The one who stood up to Bill Haslam and to special interests seeking to privatize public schools by way of vouchers. Their involvement in the 13th district House race is more interesting in light of a twitter encounter back in August relative to the Nashville School Board races. So, they don’t endorse candidates? True, the ads against Gloria Johnson don’t technically ask voters to vote against her. But, the message is pretty clear. “Every election day brings the possibility of changing course in the General Assembly. As Tennessee’s students, teachers, parents, administrators, community leaders, and education advocates continue their work to make sure every child in the state has the opportunity to succeed, it is paramount Nashville stay focused on student success. Tennessee kids are the fastest improving in the nation in education and every elected official must be committed to that work. “Tennesseans for Student Success this summer spent time across the state engaging with voters about our advocacy for all Tennessee classrooms. From school tours in Knoxville to Days of Action in Brentwood to reading events in Bolivar, we worked to advance and protect education reform throughout the state. Hmm. All the candidates they are celebrating are also lawmakers who support school vouchers. While the candidate they are warning voters about, Gloria Johnson, opposes vouchers. So, what’s the story? 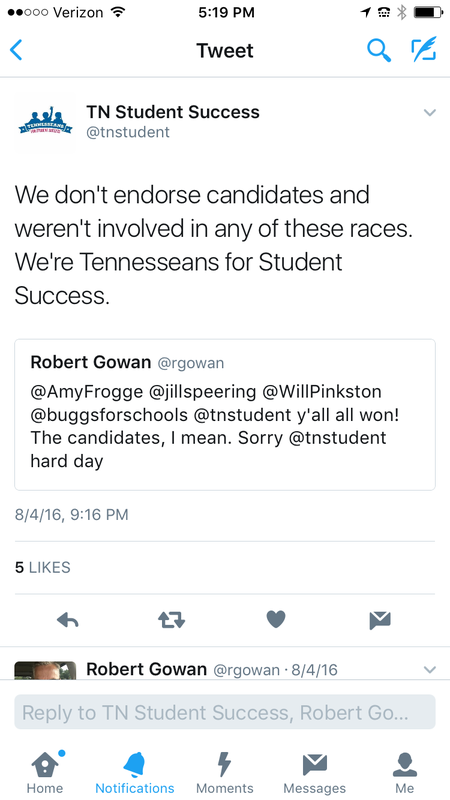 Is Tennesseans for Student Success a nonpartisan issue advocacy group just trying to help our schools? Or do they believe that liberals can’t also support student success? Or are they a front group for a Haslam Administration that supports school vouchers?